Apple Pay should now be available at all of Pei Wei's U.S. restaurants, numbering just under 200, the company said. In July, a pilot program tested Apple Pay at 16 Pei Wei restaurants in Phoenix, Arizona. The technology actually became usable across the chain on Tuesday, but the company waited a day to make an official announcement. Retail support for Apple Pay has been gradually expanding since the service launched in October 2014. Although dozens of companies are already onboard, many national U.S. chains —like Anthropologie, Best Buy, JCPenney, and Trader Joe's —have only pledged support, and not yet implemented it. Best Buy, at least, is due to launch by the end of the year. When walking into one of the trial stores, people with the latest version of the Target iPhone app may be pinged with alerts about deals and recommendations, TechCrunch noted. To prevent unwanted spam, users will first have to opt into location sharing and notifications, and Target is promising that shoppers will get no more than two alerts per trip. These notifications can appear as both standard iOS notifications or in the app's Target Run tab. The pilot stores are spread across Chicago, Denver, Minneapolis, New York City, Pittsburgh, Portland, San Francisco, and Seattle. The company is aiming to expand nationwide by Christmas, and add at some point add Android support. The app should gain more beacon-connected features over time, such as automatic reorganization of shopping lists while walking through an outlet, and the ability to request help from clerks. 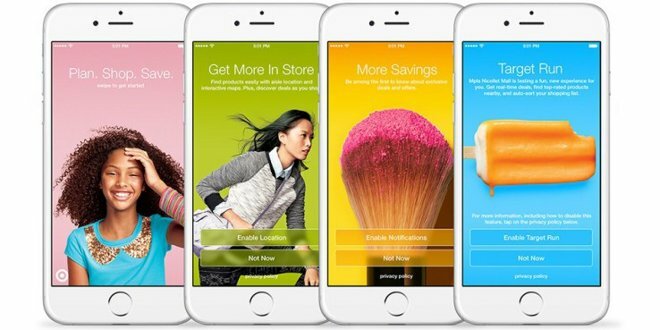 Target remarked that while it collects data from the app to track trends and preferences, beacon data is specifc to in-store locations.